Jacksonville Restaurant Reviews: Home > Downtown > [CLOSED] The Candy Apple Café – Say “Bonjour” to a New Menu, Y’all! Since opening in 2014, The Candy Apple Café has quickly established itself as a go-to restaurant for both families and date-nighters. 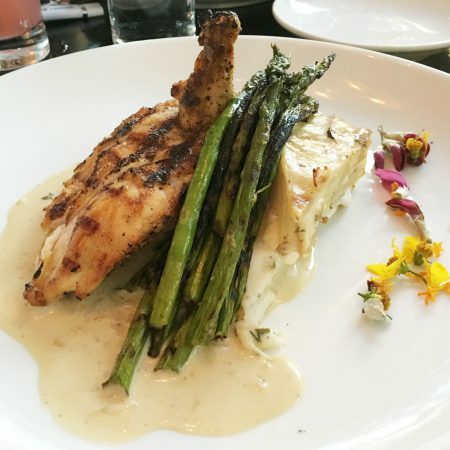 The décor is one-of-a-kind and the food is consistently delicious. Building off of their success thus far, executive Chef Jamey Evoniuk has recently taken on the task of updating and refreshing the menu a bit. The Candy Apple Café branding will also get a fresh new look, playing up the French/Southern mashup that they do so well. The new menu, which will debut on June 1st, will include some already popular dishes and will also incorporate some tasty new creations. The brunch and dinner menus in particular will be expanded with more options – 15 new items in all. But never fear – their beloved Candy Bacon will remain on the menu. Whew! We recently had a chance to taste some of the new menu items and are happy to report that they are just as incredible as the dishes we already know and love. They perfectly capture that home cooked, yet still sophisticated feel that The Candy Apple Café exudes. We started our whirlwind tasting with cocktails. The Candy Apple Café is known for their signature adult beverages as well as their craft candy cocktails, which usually include playful candy touches. Their new cocktail lineup includes some delicious new grown-up treats, such as the Verdict’s In. This mezcal-based cocktail has a vibrant pink hue with a surprising kick from the housemade jalapeno simple syrup. 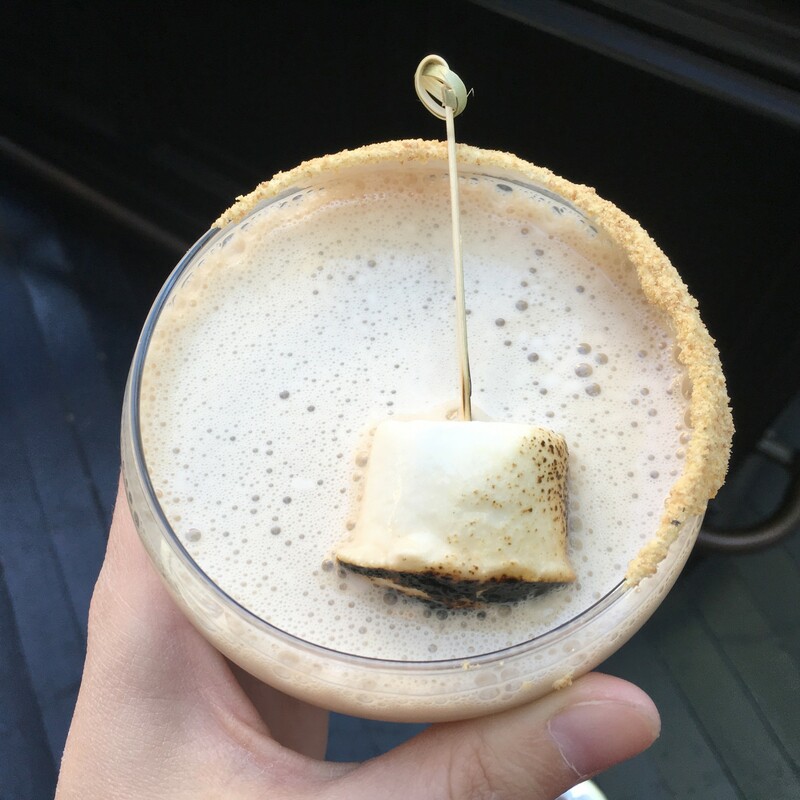 The Bourbon S’mores was also yummy. The Kahlua and the Irish cream give the cocktail rich flavor and creaminess, while the chocolate infused bourbon and Demerara syrup add chocolaty, caramel flavor. The marshmallow fluff, graham cracker crumb rim, and toasted marshmallow garnish are the perfect finishing touches, making the drink sweet and deceptively potent. After our cocktails, we were treated to an assortment of appetizer offerings. These included a beautiful Beef Tenderloin Tartare, House Chips with Bacon Dip, Buffalo Chicken Croquettes, and a choice of French Onion Soup or a Wedge Caesar Salad. 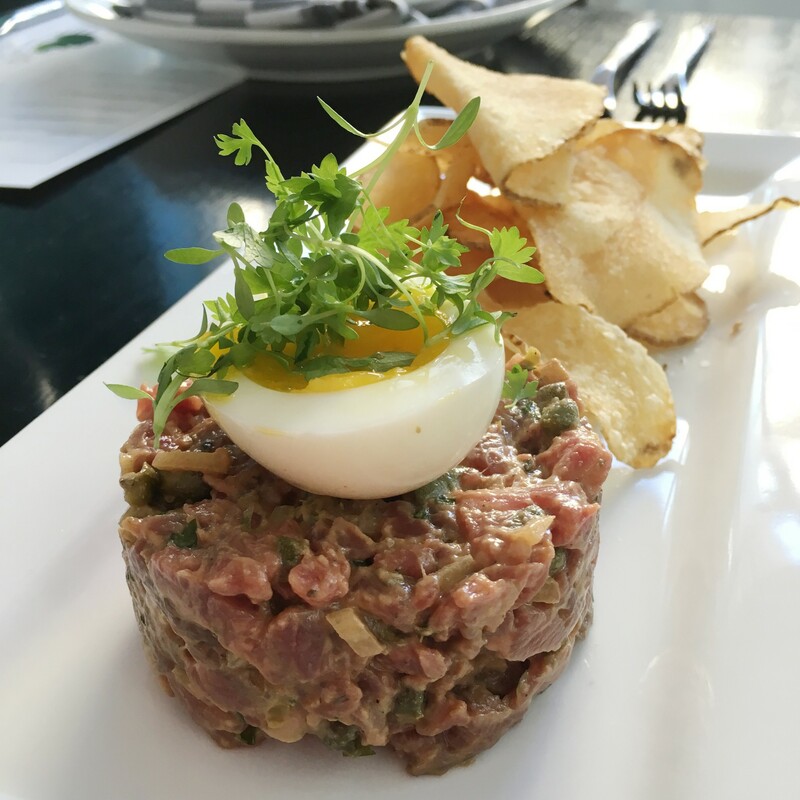 The Beef Tenderloin Tartare was surprisingly delicious. I am not a huge fan of beef tartare, but I enjoyed this one with its slight tanginess, which was offset by a creamy soft-boiled egg and served with crispy house chips. Those same House Chips made another appearance alongside creamy Smoked Bacon Dip. Be forewarned – the bacon dip is pretty addictive. The Buffalo Chicken Croquettes were equally alluring with their deep red coating of Franks Red Hot Sauce. The housemade blue cheese was a nice cooling accompaniment, and the shaved celery slaw added crunch. As part of our appetizers, we were also able to try a dish that will normally be found on The Candy Apple Café brunch menu – Pork Belly and Cheddar Waffle. While we tried it appetizer-style at our menu tasting, I would absolutely love to have it as a full-size dish. The cheddar waffle had a good balance of savory and sweet, and served as a perfect canvas for all the deliciousness going on in the pork belly. That pork belly was amazing – smoky, salty, and tender. The whole bite was accented with a dollop of sweet and tangy apricot preserves. When given the choice between salad or soup, we figured “Why not?” and tried them both. The Wedge Caesar salad was refreshing and flavorful thanks to its light pepper-parmesan dressing. 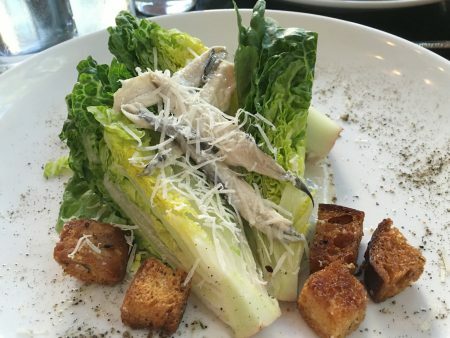 The salad was topped with boquerones (Spanish anchovies), which added a nice salty, vinegary flavor to the dish. While the salad was good, the soup was even better. We love French onion soup, especially when it is done well. This soup was done really, really well. It had the deep, savory onion flavor that we like so much, but didn’t seem as heavy and dark as traditional French onion soup. That light, buttery broth, plus the bread and gooey Gruyere cheese made for an incredible bowl of comfort food. As far as entrées go, there are some great new additions to The Candy Apple Café menu. 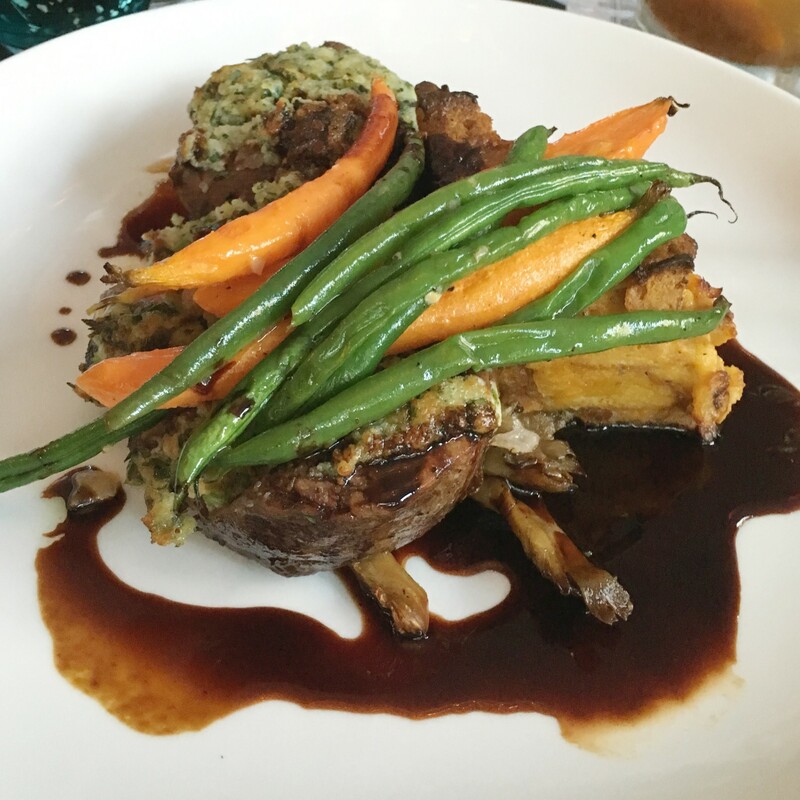 We loved the Chargrilled Filet Mignon, which was served with savory bread pudding and perfectly cooked green beans and carrots. The meat was tender and juicy, and I could eat just the bread pudding as a meal on its own and be completely satisfied. 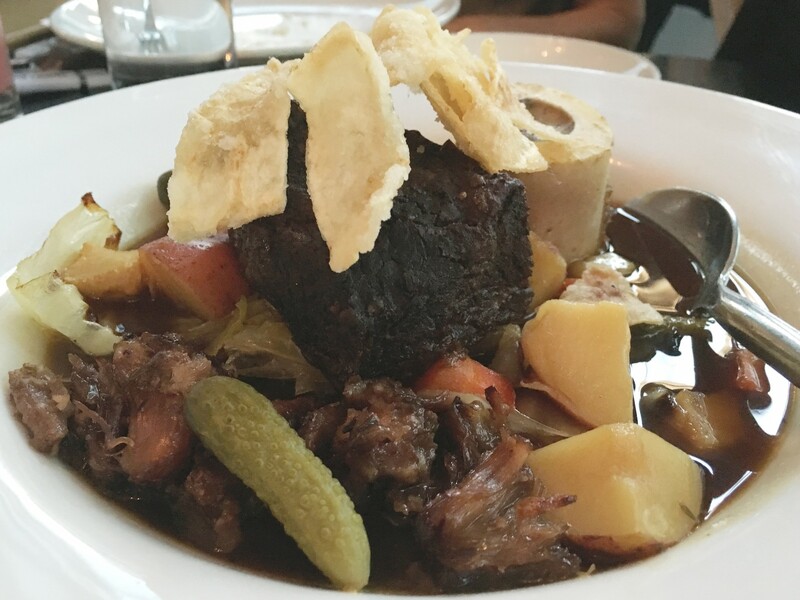 Equally as satisfying was a delicious Short Rib Pot-au-feu that will appear on the new menu. This classic French dish is like a beef stew, loaded with vegetables, tender oxtail, and a bone with creamy marrow. The broth was rich and flavorful. I typically wouldn’t order a dish like this (I mean, what’s so special about beef stew, right?? ), but it won me over and I’m already planning on going back once the new menu launches so I can have a whole bowl of it to myself. 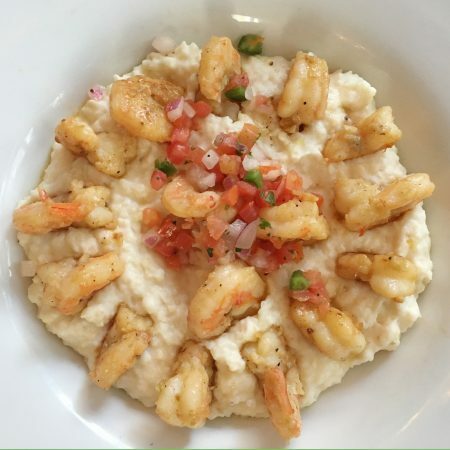 In the midst of all these new menu additions, we were also treated to an old favorite that already holds a place on the brunch menu – Shrimp and Grits. I am a huge fan of shrimp and grits and will order/devour them every chance I get. Chef Jamey’s version does not disappoint. The Mayport shrimp are plump and perfectly seasoned. And the grits, oh my goodness, those grits. These Greenway Farms grits are creamy and cheesy, but still have a little bit of a bite to them. In short, they are amazing. And I consider myself something of a grit snob. I could eat these grits all day long. 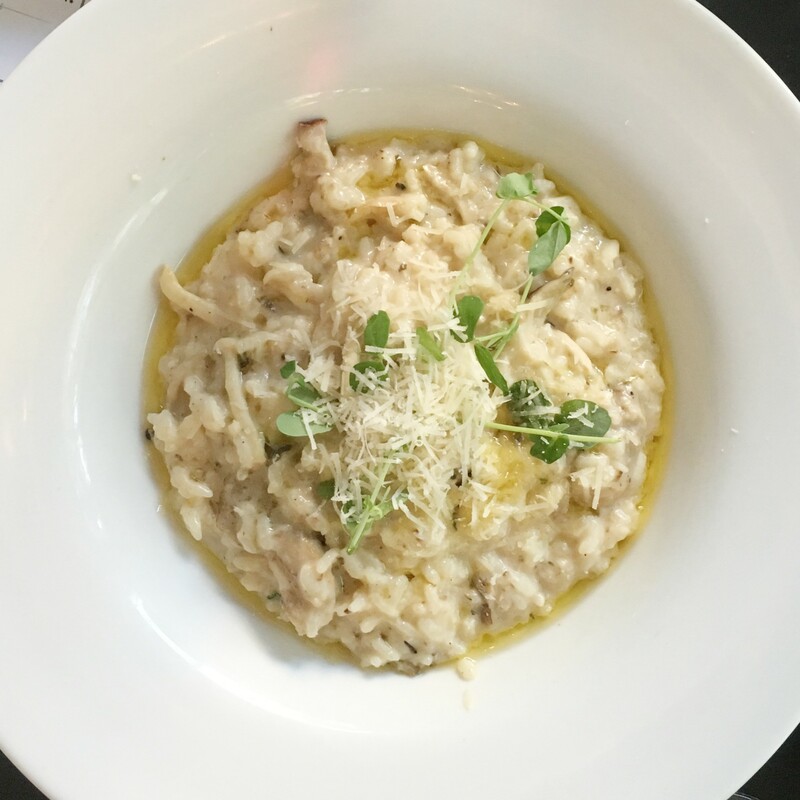 The new entrée that really blew us away at this tasting was the Wild Mushroom Risotto. Risotto is hard enough to prepare in small batches, much less at a larger volume. Often when you have risotto made for a large crowd, the texture is less than ideal. This risotto was pretty much perfect, which is a testament to Chef Jamey’s talents in the kitchen. We were not only impressed with the perfectly creamy texture, but also with the flavor. This is definitely a dish I would like to eat again. 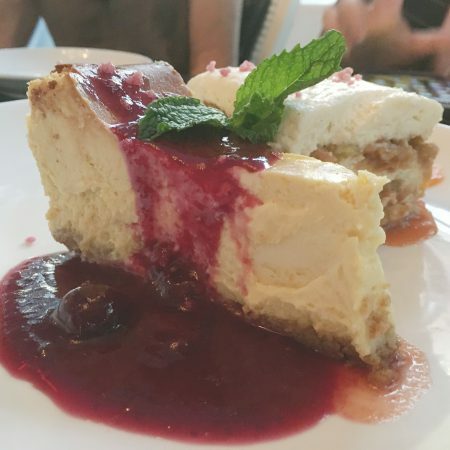 Despite being completely stuffed, we forged ahead and tried out a couple of the desserts that will soon be added to the menu. First up was the Orange Cheesecake, which was light and creamy. The orange flavor shone through and was complemented by a luscious berry compote. Next came the Ginger Carrot Cake, which servers told us was one of their favorites. It ended up being one of my favorites, too. The carrot cake was moist and had a hint of spice from the crystallized ginger. The mascarpone vanilla bean mousse was nice because, while it was creamy, it was not overly sweet as sugary frosting can sometimes be. I am a chocolate-loving girl all the way, but I loved this carrot cake. I can see why it is a favorite among the staff. There are so many delicious and exciting things happening right now at The Candy Apple Café. If you haven’t been in a while or if (gasp!) you’ve never tried it, now is the time. New menu items and a refreshed look make this a perfect time to visit this unique downtown eatery. One thing that hasn’t changed is the service – as always, service is friendly, charming, and knowledgeable. 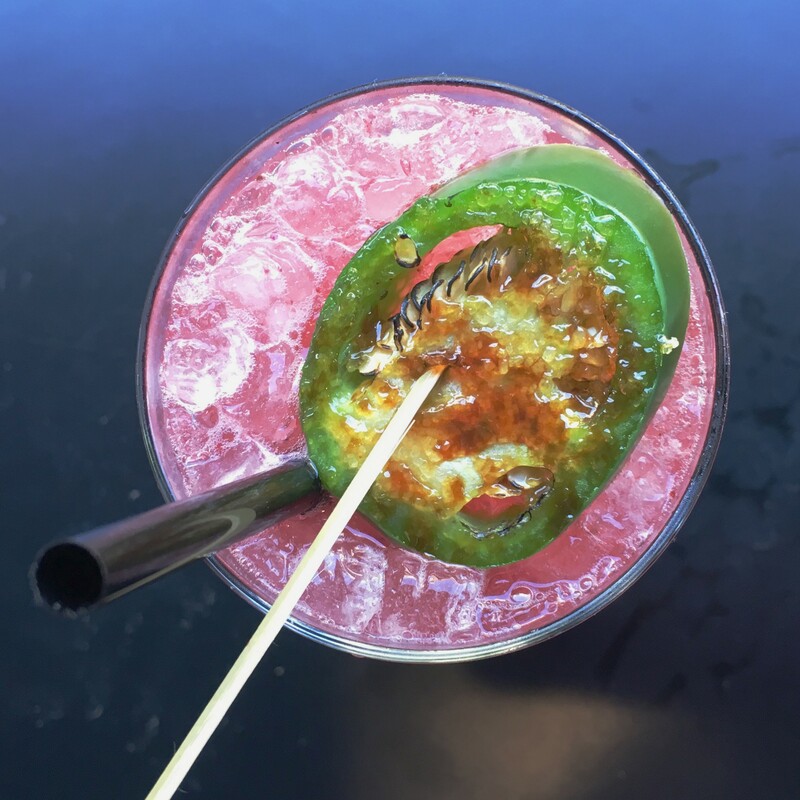 The Candy Apple Café is the perfect spot for a girl’s night out or for date night; their fantastic Happy Hour specials are reason enough to pay them a visit. But it’s also a fun destination for families, offering options for kids and adults in a delightfully playful setting. With so much going on downtown these days, The Candy Apple Café is a great central location for a meal before heading off to a symphony performance, a show, a walk around Hemming Park, or to check out the exhibits at MOCA. And now it will be even easier to stop in for eats or drinks – the restaurant will now offer valet parking Thursday through Saturday evening for $5 a car. Valet services are already available Monday through Friday from 11:30 a.m. to 2 p.m. So why not head in and check out all the délicieux new changes. Bon appétit, y’all! For this review we welcome a member of the JRR family: Rhonda Kovar grew up in the heart of North Carolina before moving to Florida after getting hitched in 2002. She is a graduate of Lenoir-Rhyne University and a lover of all things crafty, musical, or edible. Rhonda loves finding new and delicious ways to turn her two tiny picky eaters into future foodies. You can follow her on Instagram. Tagged Appetizers, cocktails, Date Night, Dessert, French, Full Bar, Girls Night Out, happy hour, Offers Valet Parking, southern, Takes Reservations. Bookmark the permalink.